At the moment I coach several ensembles that get together on a regular basis. Other pupils play together from time to time in different combinations. New ensembles are welcome. Ensembles usually make use of the so-called ‘strippenkaart’, and their members between them pay for the time I spend coaching the group. Group lessons are possible if more or less homogeneous groups can be formed, such as adult beginners, or 6 and 7-year-olds. 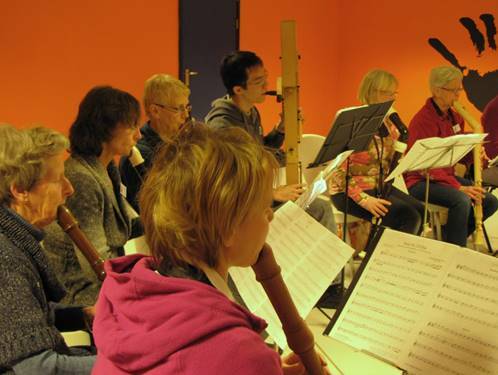 The recorder ensemble was started in September 2005 and now consists of some 30 players. Even when we started with eleven players I hoped that, eventually, the ensemble would grow into a recorder orchestra. Actually, it is beginning to look and sound like one. We have two great basses and two contras at our disposal now. The ensemble rehearses once a month on Tuesday evening from 19.45 to 21.45. 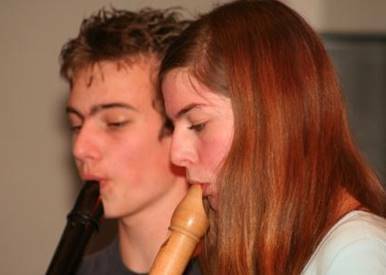 Anyone who has had recorder lessons for a few years or more can join the group. The sound of a large recorder ensemble is wonderful, and players of different levels enjoy playing together. At present, the level ranges roughly from grade 3/4 to grade 7/8. The atmosphere is very friendly, and everyone can speak English! If you are interested, you are more than welcome to join us for a trial session, just to see what it is like. The dates for 2017 - 2018 are below. 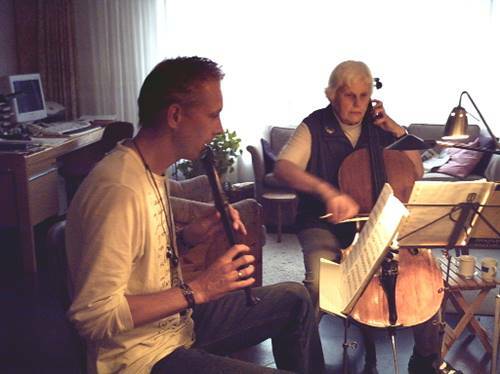 We rehearse in the music room of sports centre ‘de Blinkerd’, Seinpoststraat 150, 2586 HC Den Haag (Scheveningen). You can get there by taking tram 1 or 9, or bus 21, 22 or 23. Both Haringkade and Seinpoststraat are in the paid-parking zone now. At the Sport hall’s parking space near Seinpoststraat there are no limits to the time you can park there. At Seinpoststraat itself the parking time is limited to 1 hour, at Haringkade to 2 hours. Also see Location. 10 Tuesday evenings, once a month, between September 2018 and June 2019, from 19.45 to 21.45. The costs are €40 for five evenings.